Description: This tree is 40-90' tall at maturity, consisting of a single trunk and a rather broad irregular crown. The trunk is often crooked, but sometimes it is straight. The crown can be conical-ovoid to ovoid in shape with widely spreading to ascending lateral branches. The density of these branches varies with the growth of the tree. 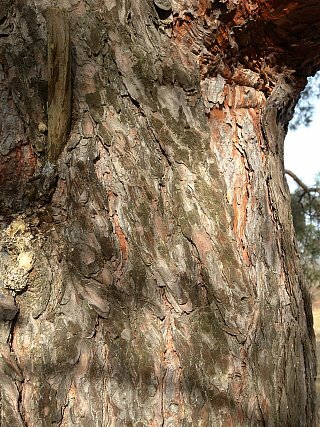 Trunk bark at the base is reddish gray and shallowly furrowed or fissured, while the thin bark of the upper trunk and major branches is orange-red and flaky. Young twigs are light brown and covered with needle-like leaves, but they become more gray and scaly in appearance with age. The needle-like leaves occur in clusters of 2 along the twigs; they are 1¼–3½" long, gray-green or blue-green, and twisted. The leaves are evergreen, remaining on the tree for 2-7 years (a shorter period of time for warm climates as opposed to cold climates). The upper surface of each leaf is slightly concave, while the lower surface is convex; there are 4-6 white lines that run along the length of the lower surface. Scots Pine is usually monoecious, although unisexual trees occasionally occur. Pollen cones develop toward the tips of young twigs in whorled clusters. At maturity, they are yellow, ovoid in shape, and about 1/3" (9 mm.) in length. Each pollen cone consists of numerous globoid packets of pollen (microsporangia) that break open to release the pollen. At this time, the scaly seed cones are purplish red and about 1/3" (9 mm.) in length; they develop in small clusters at the tips of young twigs. Cross-pollination of the cones by wind can occur from mid-spring to early summer; it typically lasts only a few days. Afterwards, the pollen cones wither away, while the seed cones continue their development and become larger in size; this development continues into the following year. Full-sized seed cones are 1½-2½" long; they are mostly green and ovoid-conical in shape while their scales are closed, otherwise they are yellowish brown and ovoid-globoid in shape. The tips of their woody scales often have vestigial prickles, but these disappear with age. At the base of each scale, there is a pair of seeds with elongated membranous wings (up to ¾" in length). Sterile seeds are not uncommon. The seeds are distributed by the wind, primarily from late fall to early spring. The root system sometimes produces a taproot up to 10' long, otherwise it consists entirely of lateral roots that are mostly shallow and widely spreading. 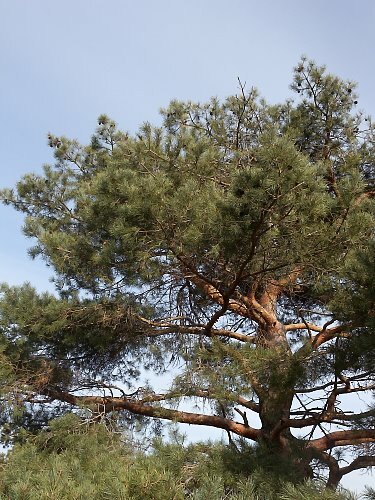 Cultivation: Scots Pine prefers full sun, moist to dry conditions that are well-drained, and an acidic sandy soil, although it also adapts to other kinds of soil. Young trees usually grow fairly rapidly, while the growth of older trees is slower. Because of disease, insect pests, and climatic factors, Scots Pine can be short-lived, but at favorable sites longevity is typically 150-300 years. Range & Habitat: Scots Pine has naturalized in only a few counties in Illinois, where it is uncommon (see Distribution Map). These naturalized populations tend to persist only in sandy areas. Typical habitats include sandy upland forests, sandy savannas, upland rocky woodlands, and open disturbed areas near cities and suburbs. Sometimes Scots Pine can be found in tree plantations and it is often used as a landscape plant. This tree was introduced into the United States from Eurasia. 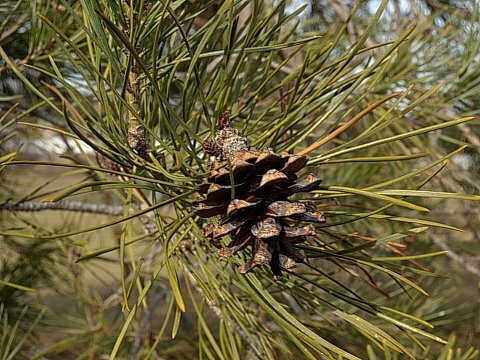 Faunal Associations: Scots Pine, like other pines, is a food source of many insects. This includes the caterpillars of the butterfly Callophrys niphon (Pine Elfin), the caterpillars of several moths, Pineus strobi (Pine Bark Adelgid), Toumeyella pini (Striped Pine Scale), the aphids Cinara pini and Eulachnus rileyi, Aphrophora parallela (Pine Spittlebug), a few plant bugs, Tomicus piniperda (Common Pine Shoot Beetle), the larvae of several long-horned beetles, larvae of the metallic wood-boring beetles Buprestis lineata and Chrysobothris cribraria, and the larvae of several weevils. The Insect Table lists many of these species. Vertebrate animals, particularly birds and mammals, make use of pine trees in various ways. The seeds and/or buds are eaten by some upland gamebirds and songbirds. These species include the Wild Turkey, Bobwhite Quail, Red-Bellied Woodpecker, Mourning Dove, Black-Capped Chickadee, Carolina Chickadee, Brown Creeper, Red-Breasted Nuthatch, White-Breasted Nuthatch, Pine Grosbeak, Red Crossbill, White-Winged Crossbill, Slate-Colored Junco, Pine Siskin, Common Redpoll, Monk Parakeet (in urban areas), and Pine Warbler. The seeds are also eaten by the Red Squirrel, Gray Squirrel, and White-Footed Mouse, while the foliage and twigs are browsed by White-Tailed Deer and Elk. Pines are favored nesting sites for some birds; these species include the Pine Warbler, Yellow-Throated Warbler, and Blue-Headed Vireo. Because the evergreen leaves provide good cover, the Evening Grosbeak, migrating Robins, various owls, and other birds use these trees as roosting sites.